This is a list of glitches in the game Donkey Kong Country. Donkey Kong needs to hold the barrel and jump on the Krusha. He will not defeat the Krusha and will jump to the side. In this instant, Diddy will defeat it. DK cannot defeat a Krusha by jumping, like Diddy. Diddy must hold the barrel and jump on the Krusha's head. Diddy won't defeat Krusha by the jump and the barrel will fall down. DK will defeat Krusha. The player needs to go through Oil Drum Alley. 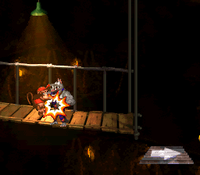 Then, the Kongs should get Rambi who's in a hole by the middle gate. Then, Rambi needs to go backwards before the middle gate and the player will find a blast barrel below Rambi resting on an area. The player has to jump over the barrel area and drop Rambi with the A button. This will only work if the player lands back on the higher land with that jump. Then, the player could jump down and after some tries, DK will land on Rambi at the same time as the player lands in the barrel. This will freeze the camera, most of the time on the area where the player lands, but some of the time by the barrel. The player will now be able to run off the screen to the right and the camera will not follow the Kongs. The oil drums that exist in that area don't block the player's way and the player can keep on running until the Kongs fall into the ditch where DK found Rambi. To bring the camera back to the Kongs and see all of the land DK covered, the player should push A to get off Rambi. The camera will zoom over to the player. The Death Freeze glitch in action. 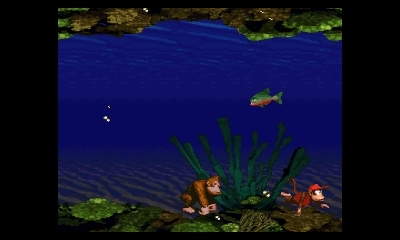 The player can control both Donkey Kong and Diddy at the same time; additionally, Donkey Kong is walking underwater. This glitch requires both Kongs to perform. The player should have one of the Kongs get hit, then grab a DK Barrel. The player should toss the barrel, then pause and exit the stage before it breaks. When the player re-enters the stage, getting hit by an enemy with the single Kong results in the game freezing. However, if the player falls into a pit as a result of getting hit, players are able to control both Kongs at once after another DK Barrel is broken. Donkey Kong is additionally able to walk underwater. Various other corruptions may occur. 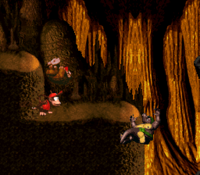 If either Kong is hit at this point, the player is brought back to the overworld. In the level Tanked Up Trouble if playing as Diddy Kong, the player should ride the mobile platform until they land on a short bridge and have Diddy positioned at the edge of the bridge then the player should wait as the mobile platform passes by the Kongs once this happens, Diddy will throw his hat like usual when the player fails something and then will jump off the platform after his hat, looking like suicide, although in doing this it will cause the player to lose a life. This can also be done in the Game Boy Advance version, though the glitch is slightly different. The player should have Diddy positioned at the edge of the bridge and wait for the mobile ride to pass; once it does, he will throw his hat, but it will get stuck; Diddy will then jump off, with Donkey Kong following him. The Diddy attacking Krusha glitch. Using Diddy Kong, the player should go to a level with a Grey Krusha, like Platform Perils. Once there, the player must stand in front of the Krusha, facing the same direction as it. Diddy will go right through the Krusha just as the player repeatedly taps , frames before collision, going right through without dying. The first of these is that Diddy will be walking, not swimming, behind Donkey Kong. The player can get off Enguarde and swim to his side. Then the player must press select. If done correctly, the camera will freeze and Diddy alone will be able to walk around as if it were a land level. While still frozen, the player could jump back on Enguarde. Diddy should turn into a greenish-blue color and hover in mid-air. This allows the player to control Enguarde by himself, which results in the Kongs being left behind if the player continues on through the level. While on Enguarde, the player can press the Y button and then the A button once quickly after. Enguarde should turn into another greenish-blue Diddy that the player will be able to control. If the player touches the other floating Diddy it will turn the player back into Enguarde. While using Enguarde once again, the player needs to press the A button quickly and repeatedly; it will permanently turn him into a reddish color with either DK or Diddy following behind. As this new red Enguarde, the player has to have Diddy follow behind him (if Donkey is behind the player, the player will have to press the A button twice and the Kongs should switch). Then, the player has to press the Y button and the player then has to press the A button. This results in Enguarde transforming into an oddly colored Donkey Kong that hovers in the air while the player is left controlling the Kongs once again. The player can redo this with DK following behind the player while the player is controlling Enguarde, and a normally colored Diddy should be hovering in the air instead of the oddly colored Donkey Kong. This glitch only works in the Super Nintendo version of the level Millstone Mayhem. Using Diddy Kong, go right and he will soon encounter a Krusha. The Kongs should lead Krusha to the beginning of the level into the area they entered the level in. Then, they should jump on Krusha as he walks to the left wall of the ditch and hold + . If done right, Diddy Kong will bounce off Krusha continuously, causing him to get infinite lives. Using Diddy Kong, this glitch only works with levels with the enemy Klump. Diddy Kong must pick up a barrel, making sure he does not let go of it. When he comes across a Klump, he must jump on its head. The barrel will be destroyed, and Klump will be knocked back. But instead, Klump will fall off the screen as if Donkey Kong jumped on his head. This glitch also works with Krusha. In levels with the enemy Klump, if the player jumps on him as Diddy Kong just as Klump is close to the edge of another platform he'll fall off as if there was a pit underneath. Only works in the Player's Choice version. This glitch only works with a single Kong. On the Kongo Jungle map, by pressing the button to enter a level on the exact moment the Kong stops on the corner of the path between Jungle Hijinxs and Ropey Rampage, Cranky's Cabin and Reptile Rumble, and between Coral Capers and Funky's Flights, the player can enter them as levels. The one between the first and second levels, the second one between Cranky's Cabin and Reptile Rumble, and the one between Coral Capers and Funky's Flights lead to near the middle of Orang-utan Gang. The first corner between Cranky and Reptile Rumble leads to Ropey Rampage. Beating or dying in any of the levels as a result of this takes the player back to the world of the proper level. This glitch was fixed in a subsequent revision of the game. This glitch was officially acknowledged by Nintendo in issue 78 of Nintendo Power, where it is named "Hidden Warp." On page 70, it is explained that the player can "find a hidden warp zone between Coral Capers and Funky's Flights in the Kongo Jungle" by "tap[ping] the B Button very quickly to skip ahead to Orang-Utan Gang in Vine Valley." The player has to enter a bonus level that has an animal crate, get on that animal, leave, and then reenter the bonus level. Then, he or she has to get on the animal buddy inside the bonus level again, but then get off it and leave. When the player comes out, he or she will be on Rambi's back. However, entering another bonus level will cause Rambi to disappear. The glitch is found only on the following levels: Bouncy Bonanza, Orang-utan Gang, and Misty Mine. This glitch only works on version 1.0 of the SNES version of the game, and can't be executed at all on the Virtual Console port; the player will only get back the animal buddy he or she was riding on upon entering the bonus level. The player must first enter any level featuring both a metal barrel and an Animal Buddy. After obtaining both, the player must toss the barrel in such a way that they can jump on it before it rolls past the animal. By grabbing the barrel right as it is about to roll past him at the right moment, the player climbs onto the animal, who turns into a miscolored sprite of the current active character that throws the barrel. If the player jumps, attacks, or enters another level while riding on the Animal Buddy when it is like this, they automatically revert to normal. In Mine Cart Carnage, if a player takes damage and then lands directly on top of an overturned mine cart while still maintaining post-damage invincibility, the overturned mine cart will transform into a moving empty cart in front of them. If this empty cart falls off or hits an enemy, however, the player will lose a life. The player must play as Diddy Kong with Donkey Kong following him. They must enter into the bonus level with Neckies. Diddy must run to the first Necky and damage himself. He gets frozen, and Donkey Kong must stomp the same Necky and fall into the abyss, causing the player to lose an extra life. They must re-enter the level, but instead of being in Temple Tempest, Donkey Kong will be thrown out of his house in Jungle Hijinxs. If the player presses and then , they will return to the Vine Valley world and Temple Tempest is unfinished. If the player dies before completing Jungle Hijinx, they will remain in the first world. If the player completes Jungle Hijinx, they will still remain in the first world. It might take the player several tries in order to perform the glitch. This page was last edited on April 15, 2019, at 15:15.